Now I have cut the first panels of the jacket I can get onto some real exciting stuff – making it up into the Ultimate Tennant Suit! First I had to correct a minor problem with the back of the suit, which involved re-cutting a new panel for the area above the belt. I was trying to get round it, but had to bite the bullet. I used the fronts from the pair that had provided the front panels of the suit. The reason I recut was to correct the grain direction of the fabric, which should run slightly diagonally from the waist to the shoulder, not the centre back. Anyway, that out of the way I can at last start sewing some real GAP fabric! I start with the front panels, and stitch the chest darts, which run vertically from the upper chest down to just above the pockets (see right - the first line of stitching!). Once this is pressed out, and the fronts are interfaced as per the Hand Tailoring I outlined recently, I can think about making and setting the breast pocket. 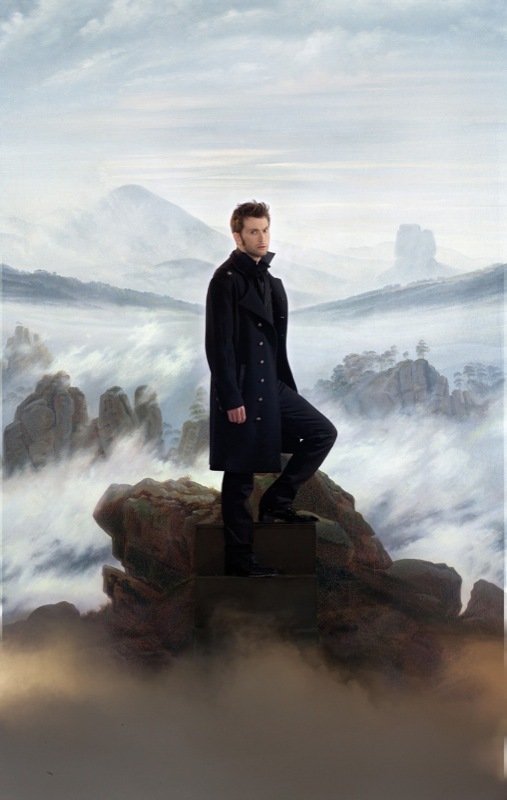 It is sewn on the surface of the jacket with a separate flap above. The pocket has a box pleat on the front. This has to be constructed very carefully, as it must span precisely three pinstripes. 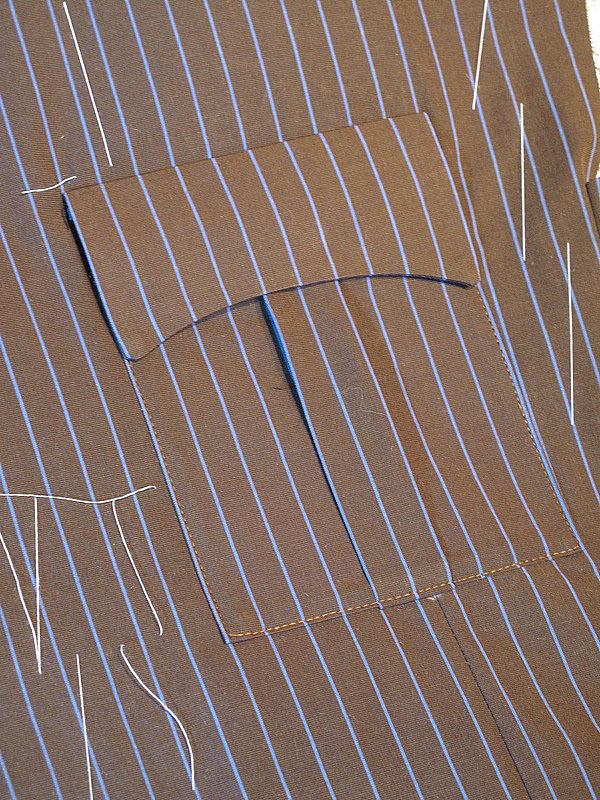 The trick is to stitch up the centre behind the pleat at just the right place so a pinstripe lines both front edges of the folds (see left, top). 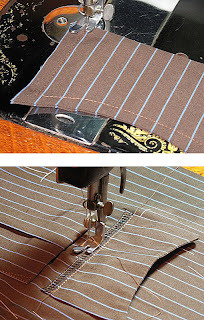 I then press the edges under, again lining along the pinstripes, with a one inch roll-fold at the top. 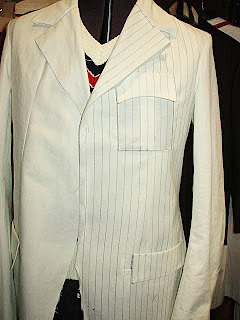 This is then pinned in place, aligning it with the pinstripes on the body of the jacket (see left, middle). There is a level of compromise here as the chest dart expires under the pocket. 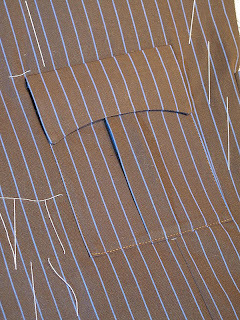 This means it is possible to square the pocket to the pinstripes on one side only (take a sneak at the finished pocket and look at the right-hand edge to see what I mean). Finally the pocket is top-stitched in place, with a sort of stretched triangle of strengthening at the top corners (see left, bottom). I then need to do the breast pocket flap. This is quite simple really. First I sew the flap together from two pieces of fabric, leaving it open at the top (see right, top). This is then clipped at the corner points and the seams graded before turning and pressing it flat. To stop the attaching edge bulking, I overlock the open end (rather than double-fold it) and then stitch it in place above the pocket (see right, bottom). Once flapped into position I then firmly press the edge and it happily sits in the right place. Here is the finished, pressed and crisp result (see left). The white stitching around the pocket is tack stitches I have put to keep the body of the jacket and the horsehair interfacing together while I work – these will obviously be removed before I finish! For those that don’t know, the Radio Times holds an annual party at rthe beginning of the year to celebrate those celebrities who have adorned their covers the previous year. There is a certain cache for appearing on the cover, and as a prize each subject receives a presentation famed print of “their” cover to treasure! 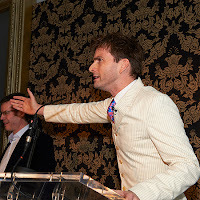 This years event was hosted by ex-Doctor David Tennant and he had the pleasure of presenting the covers to Karen Gillan (see above), as well as a whole host of other notables including Aiden Grimshaw, Keeley Hawes and the Downton Abbey cast. The evening is rounded off with a party – not quite in the league of the Vanity Fair Oscars bash – but we like to think it’s up there with the best of the rest! 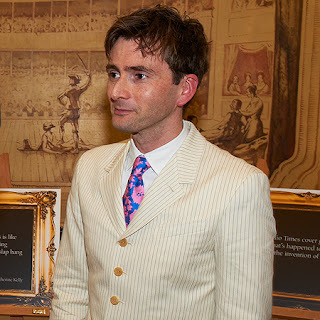 David was, as ever, impeccably dressed in a curiously reminiscent two-piece suit looking not dissimilar to his classic brown or blue pinstripe he wore as The Doctor! (see right). He was like a negative Doctor! A number of pictures from the event appear on the Radio Times Website, as well as in the current week’s (29 jan - 4 Feb) issue. 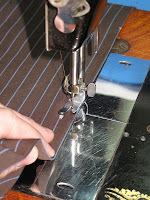 This past weekend marked the start of cutting the GAP fabric for the Ultimate Tenannt Suit I am making. Pair 6 (Size 33 x 32). This will be enough to get the body of the jacket made, including all the pieces for the pockets and more than enough to get me started. It’s gonna be funny looking at the finished jacket and know that that was a back of a leg and that was a front! I think it will change my view-point on the suit next time I see an episode – which will be interesting! It’s fascinating to see the reality of how they are cut, so here is a breakdown of how the pairs were dissected and what parts of the jacket they each provided. I choose the waist 34s pair to cut the back panels as they just fit, leaving minimal waste. What is left over still doesn’t entirely go to waste, as I then used it to cut the breast pocket flap and the back strap. The front panels of these trousers are the widest pieces of fabric I have, which is just as well since they need to cover from the lapel edge to the apex of the shoulder. The small area of waste at the top gives me enough to make the facings of the outer pockets (the piece you see at the back of the pocket when you look inside it). finally I need to cut the side panels, so to preserve as much of the fabric as possible, I have dropped to the narrowest waist I have. From these I have used the fronts of the trousers are the narrower of the harvested panels available. I can still happily get the panel I want out of here, leaving a decent chunk of waste from where I cut the breast pocket and most of the pieces I need for the outer pocket flaps. 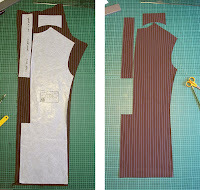 This completes the cutting I need for the body of the jacket, meaning work can start in earnest . . .
Now I have finished the calico test for the suit I am making, I thought I’d take a brief break and show you some of the new techniques I have used in making it. I have been slowly drifting away from “home-sewing” and steering towards more professional, traditional techniques. The test I have made (see right) contains absolutely no fusible interfacing. Instead it uses a variety of non-fusible stiffening materials, much more appropriate for a suit of this nature. To learn the use of these I made a half-scale sampler of a tailored jacket during the autumn term at college, using a very helpful text book for guidance (see left). Doing the jacket in half-scale speeds up the process and makes it a handy reference piece. Only one side is made – since it is a mirror of the other – and by not closing it off completely, it will allow for inspection so it can be an on-going reminder of how it was made. A sampler like this can become as involved as you like, with outer and breast pockets, linings and inside pockets – but I’m concentrating on the collar and lapel construction so will limit myself to this – I won’t even be setting a sleeve. While working on numerous projects, you inevitably accumulate left over fabrics or buy materials with good intentions that never get used. This happened with some moleskin I bought years back (pre-dating my blogs), planning to make my then MkII Tennant Coat with it. Before work could start, I found the Malabar, which I still use today. The moleskin went to stock, but I did then try to use it to make an Inverness Cape, but that proved to be a very unsatisfactory exercise. More recently, while sourcing potential fabrics for my Six Coat, I bought some green baize from a John Lewis remnants box (see right). Sadly it wasn’t a match, but luckily it was only a metre at most, and I only paid half-price for it, so I put it done to experience. Again this went into stock, and today it bounces back out, this time to make my jacket sampler. 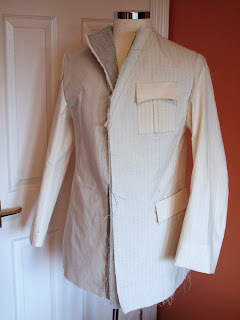 My tutor has given me a basic jacket pattern to use, which I cut it from my fabric. Next thing I need to do is cut my own pattern for the interfacings, based on this supplied pattern and covering the areas that need support. 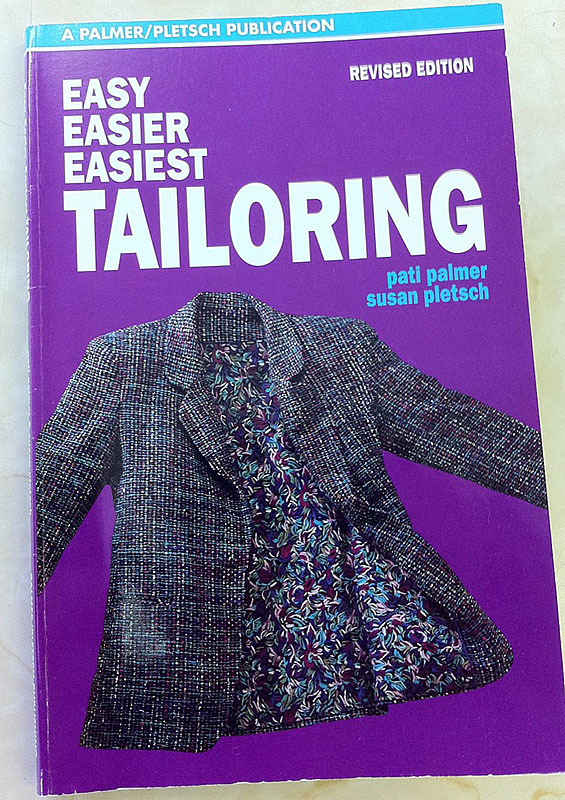 This covers the shoulder area of the back, sweeping down under the armhole to give support to where the sleeve joins; and on the front, covers the upper chest, the front edge of the jacket, and again under the armhole. 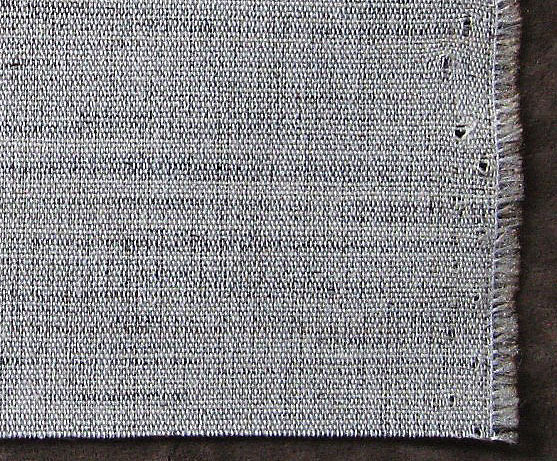 The intention here is to use zero fusible interfacings which are principally hand-stitched in place, and made from traditional non-fusible, woven cotton and horsehair (see left). It is fairly stiff (to give the support I need), but flexible with a springy quality (which bounces back during wear) ideal for this use. 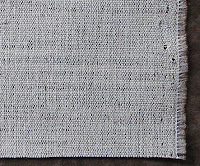 Being woven it has a grain, which I need to cut to match the grain of the body. 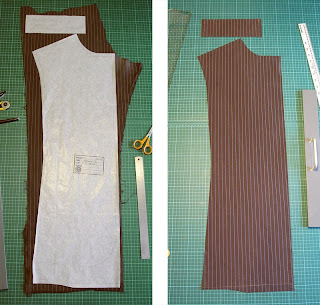 In both sets of pictures are: left, jacket pattern with interface pattern laid on top; centre, the cut body of the jacket with woven cotton/hair interfacing in place; right, turned right-side, the interfacing is tacked in place. 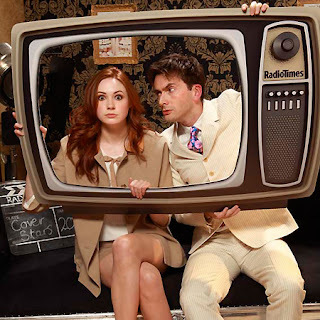 David Tennant costumes up for sale! Calm down - it’s NOT any of his Doctor Who stuff! Deep breaths. News this week from The Royal Shakespeare Company, who are planning to hold a big sale of their excess theatrical costumes. It is taking place on Saturday 12 February from 10am to 5pm at their RSC Rehearsal Rooms, Arden Street in Stratford-upon-Avon. Around 10,000 items including costumes, shoes, hats and accessories will be available to purchase. This is identical to the Angels Costume sales that were held over the past couple of years. 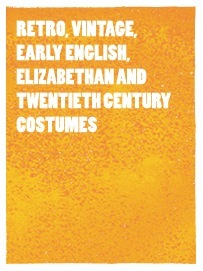 The RSC Costume Store is currently home to over 40,000 costumes. Their last costume sale was in 2007, and the RSC now needs to free up more space, both to create better storage conditions, and to make room for costumes new to the Store. By the sounds of things the bulk of stuff on offer are stock items (such as shoes: 1,000, shirts: 500 and hats: 300) originally constructed by the world renowned RSC Costume Department. These have been chosen from the RSC Costume Store, which hires out RSC costumes after they have finished being used in its productions. There are also Egyptian head-dresses, a variety of military uniforms, cloaks, clerical outfits – including nuns and priests, jewellery and chain-mail. The items cover a wide range of periods, including retro, vintage, Early English, Elizabethan and twentieth century. Amongst the items for sales are soldiers’ tabards and chain-mail from the RSC’s 1984 production of Henry V (with Kenneth Branagh) and later seen in Mel Gibson's film Braveheart, and – of interested to the Doctor Who fan community – numerous items worn by David Tennant (including his understudy costume from the 2008 production of Love’s Labour’s Lost). If you’ve been following the progress making the calico test for The Ultimate Tennant Suit – then this is what you’ve been waiting for! I’ve hand-stitched the last bits around the collar, and set the four buttonholes and buttons (see left). I’ve also done some other minor stitch work, just to help keep everything in its place. I’m slowly getting my calico test jacket together. 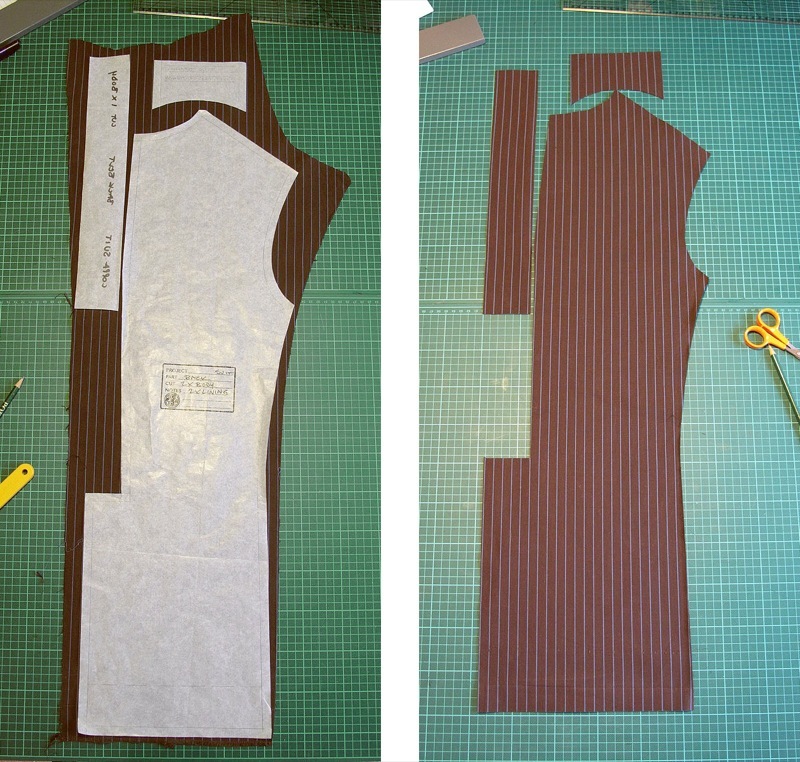 So far I’ve cut the Pattern, and made the body and prepared the Lining ready to go in. But before I cna final insert the lining I need to sort out the collar, as my method needs everything to come together at once. I have cut the pattern for my collar, bearing in mind that the front edges need to be parallel to the pinstripes, meaning the two edges themselves are parallel. This restricts and dictates the shape I am working with (see below, left). I need to cut this in under collar melton – I am using some of the green that I bought to test match the Six Frock Coat. It wasn’t quite the right colour, so it’s an excuse to use it up. 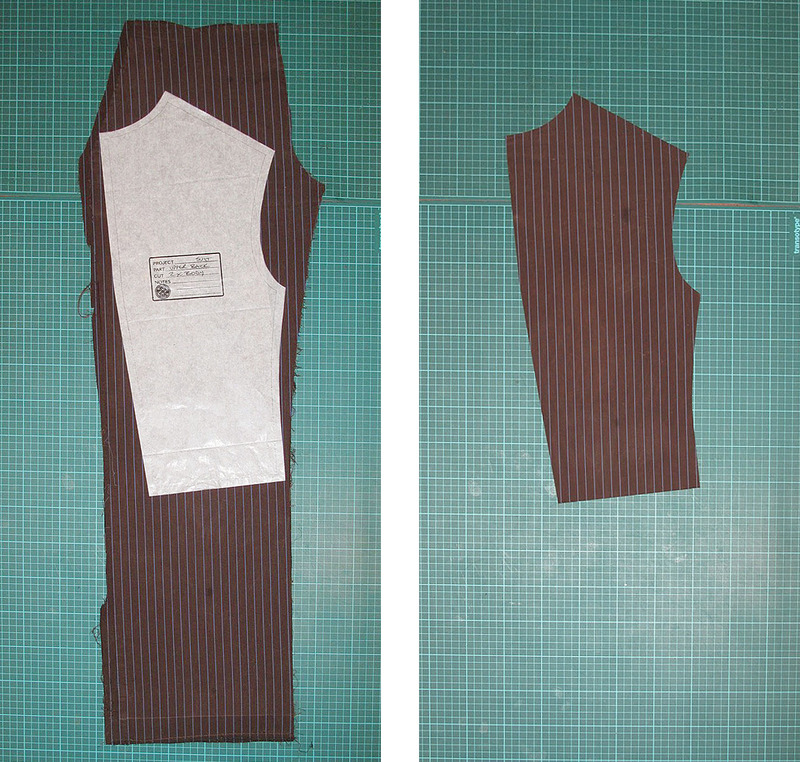 I have also cut some stiffening to go around the neckline, over which the collar will flop (see below, right). 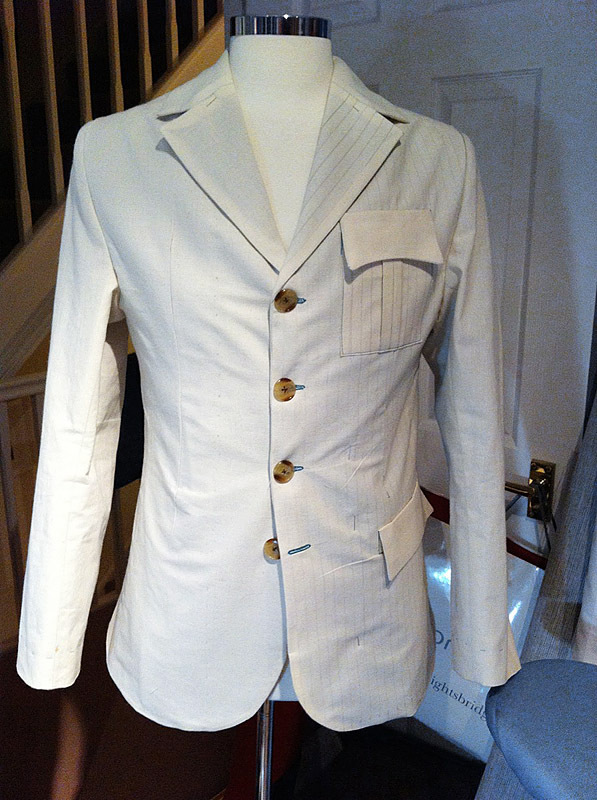 I then assemble the collar, the under collar and lapels, which are already attached to the lining (see left). I have also drawn some pencil lines on the lapels to simulate the pinstripes to make sure everything is cut to the correct proportion. This then completes the lining ready to put in place (see below). So far I have cut the Pattern for the body of the Tennant Suit, this time with allowance for the limited fabric available when I cut the GAP trousers (see right). There was a lot to think about, but I got there in the end. Next up is doing the sleeves. First I draw a block for the sleeve based on the measurements I need (see below, left). From this I have traced off the two parts, smoothing the corners at the elbow, and adding a cuff allowance (see below, centre). Finally this get traced off onto tissue paper, adding seam allowances as I go (see above, right). Once I’ve cut what I need from calico, it’s then a simple process to make the sleeves up and set them in the jacket (see right). Don’t forget that at the moment the hem isn’t turned up, so it looks a little long. Now before I start cutting any of the precious GAP fabric, I need to be 100% certain on the pattern I am using, therefore I an going to make a new calico test jacket. I have previously done such a test (see left) but I do need to make some serious revisions due to one major restraint I am now faced with that I didn’t have to worry about back then. 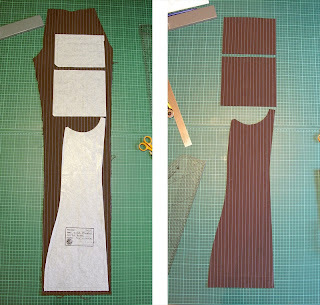 The first thing I have to do is re-draft the basic block from which my pattern will be drawn (see below). 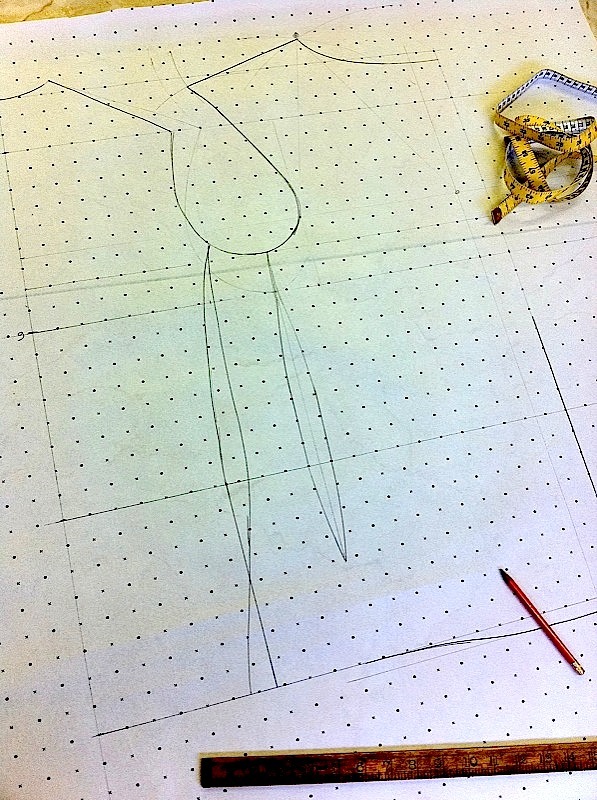 It is while I am tracing off my pattern pieces that something struck me, which means I need to stop and think carefully. 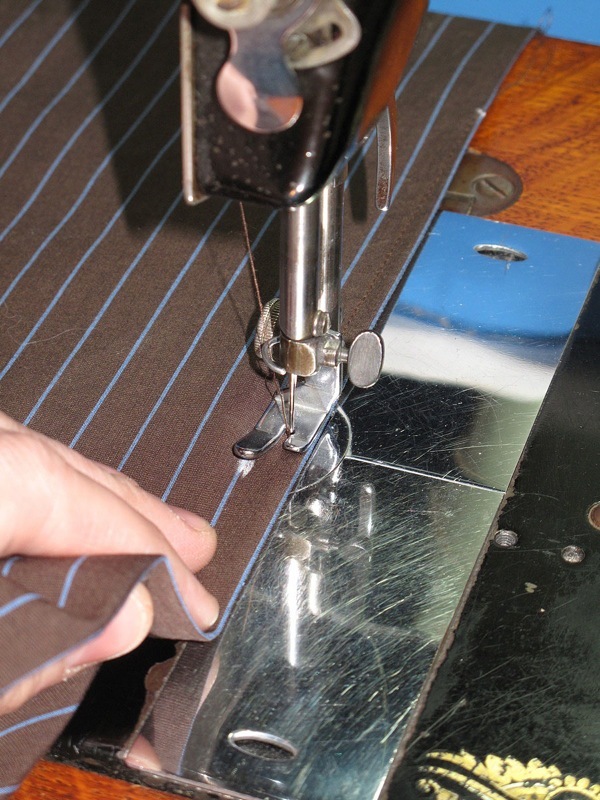 Although I have a good range of sizes of trousers to use, ranging from a couple of waist 33s up to the biggest at waist 36, I have realised that even these will not cover the pattern shape for the front panels – well not in the same way I cut them last time around.